Forth Rail Bridge is the world's first bridge built entirely of steel. 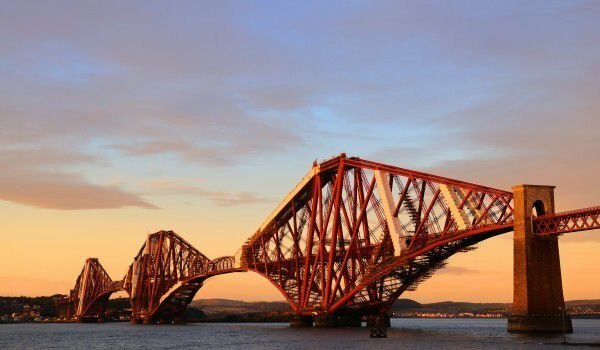 Raised in the early 19th century, Forth Rail Bridge is considered a miracle of engineering and performance. It was the largest such facility of its time, and today is one of the most peculiar and intriguing sights on Scotland. Forth Rail Bridge was built over the River Forth, connecting by railway cities Edinburgh and Dundee, 14 km west of the capital Edinburgh. It is the connection between South Queensferry and North Queensferry. The need to build a connection between the two sides of the Forth River appears at the beginning of the 19th century. The original idea was to build a tunnel, but after a few trials and measurements, this project was abandoned. In 1806 was born the idea of building a bridge, and in 1818 were already presented several projects, including that of Mr.James Anderson. In 1878 construction began on the Forth Rail Bridge, under the guidance of designer Thomas Bouch. One year later, due to a severe storm another newly built bridge by the architect - The Tay Bridge collapses and kills 75 people. Therefore, the draft of Bouch for Forth Rail Bridge has been terminated. New Forth Rail Bridge is the work of Sir Benjamin Baker and Sir John Fowler, and production is by Sir William Arrol. Construction of three major consoles starts in 1883 and takes about 5 years. Forth Rail Bridge, built entirely of steel to compete only with the Eiffel Tower in Paris , but is still her superior. The opening ceremony of the Forth Rail Bridge was on March 4, 1890, when Prince of Wales (later King Edward VII) put the last screw in, which is gilded and inlaid. Length of Forth Rail Bridge is 2.5 km. In preparing it 55, 000 tons steel were spent, 18, 122 cubic meters of granite, eight million rivets. During the seven years of construction, total 4000 men were involved in the process. Of these, at least 57 were victims in an accident and died (some say the number of deaths exceeds 80). The life of 8 more men were rescued by rescue boats that sailed into the river during construction of Fort Rail . Hundreds remained forever crippled. The total amount spent to build steel miracle amounted to 3.2 million pounds, including the cost of 250 000 pounds for the previous works. Forth Rail Bridge was put into operation on January 21, 1890 - several weeks earlier than its official opening. On this day in Forth Rail Bridge 2 trains can pass one another, each with 50 wagons, weighing 900 tons each. When built Forth Rail Bridge was considered the eighth wonder of the world. It is in operation to this day, after major repairs, in recent years. At present the steel construction of Fort Rail is an important part of the rail network on the East Coast. Daily, between 180 and 200 trains pass through here.